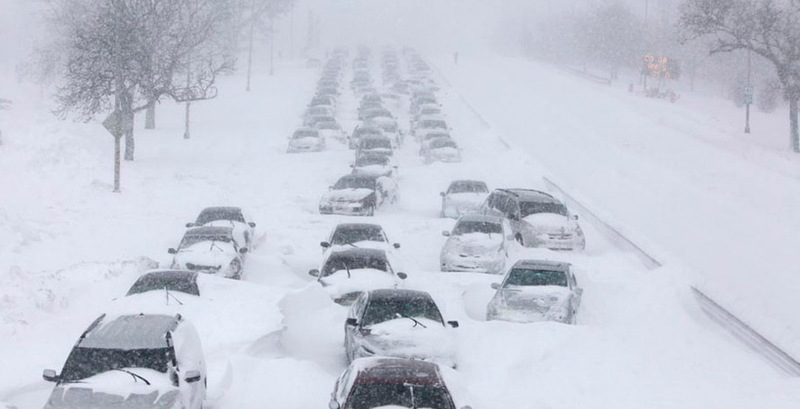 JNN 19 Nov 2014 New York : Four people died during a storm that dumped more than 4 feet of snow around Buffalo and forced motorists in 150 vehicles, including a women’s basketball team, to ride it out on a day when temperatures dropped to freezing or below in all 50 states. Temperatures in all 50 U.S. states dipped to freezing or below on Tuesday as an unseasonably cold blast of weather moved across the country while heavy snow prompted a state of emergency in western New York and contributed to the deaths of four people. Every U.S. state, including Hawaii, was bitten by temperatures at the freezing point of 32 degrees F (0 C) or below, the National Weather Service (NWS) said. It was the coldest November morning across the country since 1976, according to Weather Bell Analytics, a meteorologist consulting firm. Typically, such cold is not seen until late December through February, the NWS said. One person was killed in an automobile accident and three others had heart attacks, including two believed to be shoveling snow at the time, Erie County officials said. The snowstorm stranded cars, trucks and buses on a four-mile section near Buffalo. By late Tuesday night, many — but not all — had been freed. Some motorists had had been trapped for nearly 24 hours. Officials said freeing the vehicles was delayed after two tractor-trailers jack-knifed as they were being moved. Meteorologists say temperatures in all 50 states fell to freezing or below on Tuesday. They say the low temperatures were more reminiscent of January than November. Parts of Erie County, western New York, had 60 inches (1.5 m) of snow, with more falling, said Steven Welch of the National Weather Service near Buffalo. County officials said on Tuesday there had been four storm-related deaths. One person was killed in a traffic accident and three others died after suffering heart problems, two of whom were believed to have been shoveling heavy snow at the time. Snow fell at a rate of up to five inches (13 cm) an hour and some areas approached the U.S. record for 24-hour snowfall totals of 76 inches (193 cm), the NWS said. New York Governor Andrew Cuomo declared a state of emergency for 10 counties. National Guard troops were deployed to help residents cope with the storm. A total of three to four feet (0.9 to 1.2 meters) of snow was expected in many areas of western New York and as much as six feet (1.8 meters) elsewhere, the NWS said. A 140-mile (225-km) stretch of the New York State Thruway along Lake Erie and Lake Ontario was closed. Bans on driving were implemented in some places. In the south of the United States, states were bracing for a record chill from the Arctic-born cold that swept the Rocky Mountains last week. In Florida, freezing temperatures were expected through Wednesday morning, the NWS said. In New Hampshire and elsewhere, icy roads led to accidents. Lake-effect storms in Michigan produced gale-force winds and as much as 18 inches of snow, and canceled several flights at the Grand Rapids airport. Schools closed in the North Carolina mountains amid blustery winds and ice-coated roads. In Indiana, three firefighters were hurt when a semitrailer hit a fire truck on a snowy highway. In Atlanta, tourists Morten and Annette Larsen from Copenhagen were caught off-guard by the 30-degree weather as they took photos of a monument to the 1996 summer Olympics at Centennial Olympic Park. “It’s as cold here as it is in Denmark right now. We didn’t expect that,” Larsen said, waving a hand over his denim jacket, buttoned tightly over a hooded sweatshirt. In Buffalo, Brian Krzeminski watched the snow pile up outside the south Buffalo convenience store where he worked overnight and served free coffee to the motorists and pedestrians who came in off the city streets to get out of the blinding snow. The National Weather Service warned that the snow, generated by cold air blowing over the warmer Great Lakes, would continue through Wednesday and could eventually total 6 feet in places. New York Gov. Andrew Cuomo deployed 150 member of the National Guard to help clear snow-clogged roads and remove abandoned vehicles. “All around us, it’s a solid 4 feet of snow that is so thick and so heavy you can hardly move it with a shovel,” said Oakley, whose son Todd was with her, unable to make it to work just three miles away. Jim Lehmann was hunkering down with his wife in their town of Hamburg home, while outside his neighbor’s house was barely visible through the blowing snow. The town of West Seneca recorded 45 inches by late morning and Alden, to the east, had 48 inches. But typical of lake-effect snow, areas just a few miles away, including downtown and north Buffalo, had just a couple of inches. At one point, nearly half of West Seneca’s plows were bogged down in heavy snow, officials told The Buffalo News. In neighboring Orchard Park, the highway superintendent called the rate of snowfall “unbelievable,” while next door in Hamburg police cars were getting stuck. Oakley and her son, Todd, were passing the time watching “Dumb and Dumber” on Netflix. This entry was posted in America, United States and tagged Buffalo, Cold Weather, National Weather Service, NWS, Snow Storm, US States. Bookmark the permalink.